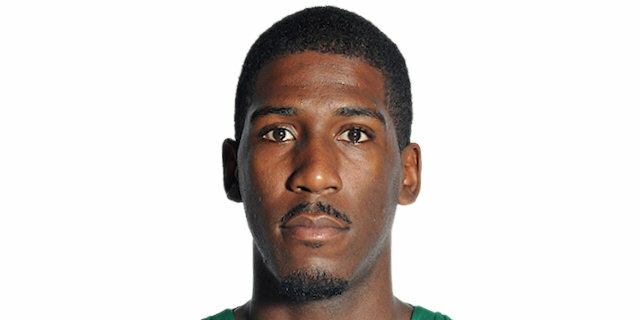 Panathinaikos came up strong when it mattered most to beat Maccabi Electra 69-78 on Thursday at Nokia Arena in Tel Aviv, tying their best-of-five Turkish Airlines Euroleague Playoffs series at 2-2 and forcing a decisive Game 5 next week in Athens. The game featured four lead changes in the last five minutes, but after David Blu put the hosts up 67-66, Dimitris Diamantidis scored 6 free throws in the final three minutes as the defending champs outscored Maccabi 2-12 the rest of the way to claim the victory. Panathinaikos had led for most of the game and was up 11 in the third quarter, but Maccabi always rallied back until running out of shots down the stretch. Nick Calathes paced the Panathinaikos attack with 15 points, former Maccabi star Sarunas Jasikevicius netted 13 and Diamantidis and Kostas Kaimakoglou had 12 each. Devin Smith and Keith Langford paced Maccabi with 14 points apiece, Lior Eliyahu scored 12 and Yogev Ohayon tallied 9 points and 9 rebounds in defeat. The visiting guards worked the ball into Steven Smith and Mike Batiste for the game’s first two baskets. Romain Sato picked up his second foul just two minutes into the game and soon became the first substitution. Langford followed with a long jumper for Maccabi’s first score. 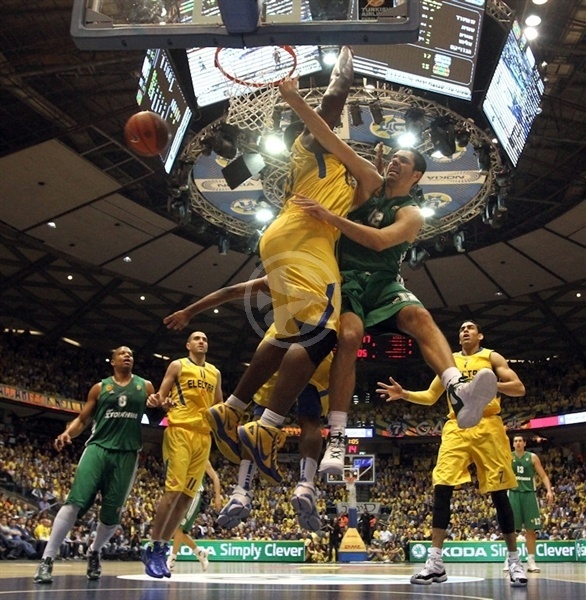 Calathes drove for a layup to make it 2-6, but Maccabi bounced back. Richard Hendrix rose to tip in an Ohayon miss and then, after Sofoklis Schortsanitis came in for Hendrix, Eliyahu tied it and Langford gave Maccabi its first lead. Diamantidis rifled back from downtown to make it 8-9 midway through the quarter. Devin Smith’s fadeaway was bettered by Calathes’s basket-plus-foul. The lead continued to trade hands from basket to basket as Ohayon and Stratos Perperoglou exchanged threes. Devin Smith knotted the score at 15-15 with a pair of free throws and then Langford pulled up and put the hosts ahead. Perperoglou tied it once more with a long jumper, but Tal Burstein left the hosts on top 19-17 after 10 minutes. 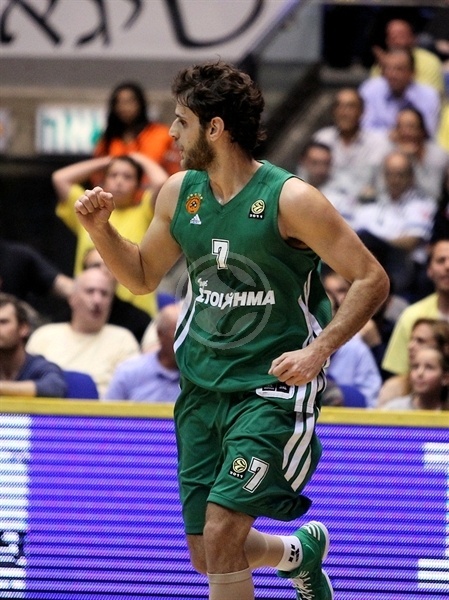 Ian Vougioukas came off the bench to score twice, stick Big Sofof with his second foul and keep the Greens in it. In between, a pretty Theo Papaloukas dish to Hendrix put Maccabi ahead temporarily. A Diamantidis layup and 2 more free throws from Vougioukas made it 21-25. Devin Smith and Vougioukas traded points. Shawn James helped Maccabi get back with free throws on consecutive possessions, but a Jasikevicius triple made it 25-30 midway through the second quarter. An Ohayon steal led to a Devin Smith basket. After missed Vougioukas free throws and a missed James slam, Perperoglou connected from outside. Eliyahu grabbed an offensive rebound and scored, then got another bucket via a goaltending call on Batiste to draw his team within 2. Calathes went coast to coast for a layup to keep the Greens ahead. Ohayon and Eliyahu used their speed to get baskets, but Jasikevicius and then Calathes from downtown protected Panathinaikos’s cushion. A David Blu free throw and another by Batiste put 36-41 on the scoreboard at halftime. After Devin Smith closed the gap to 3, Calathes took charge with a layup and a three to put his team up 8. Steven Smith then buried a wide-open timeout from the corner for a 38-49 lead, which prompted Maccabi coach David Blatt to call timeout. Ohayon got the crowd back with a jumper from the top of the key. 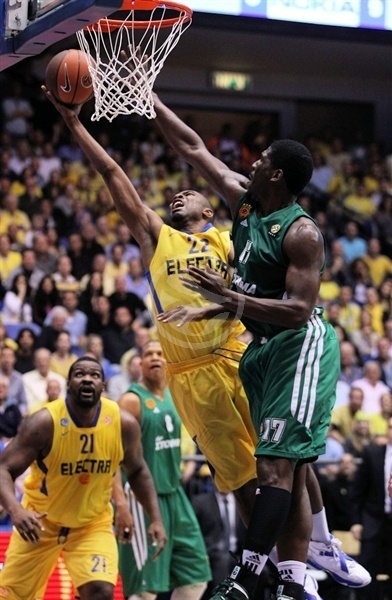 Then Eliyahu fought for a basket on the offensive glass. And a Langford triple had Nokia Arena rocking as Panathinaikos coach Zeljko Obradovic called a timeout with the score 45-49. 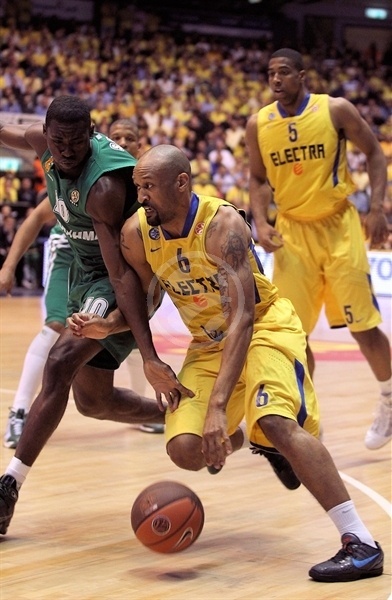 The momentum remained yellow as Ohayon squeezed in between the Panathinaikos trees to tip in his own miss and cap a 9-0 run. Perperoglou found an open Steven Smith cutting for a slam. Kaimakoglou made it 47-53 from the line. 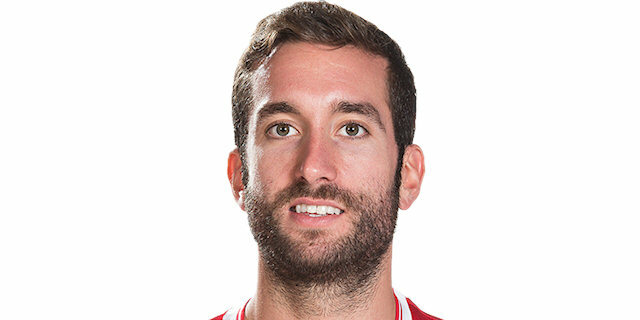 Burstein hit back with a three from the left wing. Diamantidis split free throws to leave the score at 50-54 through three quarters. Jasikevicius sank a big jumper and then Kaimakoglou nailed a three as Panathinaikos quickly extended the margin to 51-59. Devin Smith got 2 back from the line and then Langford added a jumper. Langford electrified the crowd with a spinning drive for a basket-plus-foul to make it 58-60. A Jasikevicus layup was matched by Hendrix free throws. 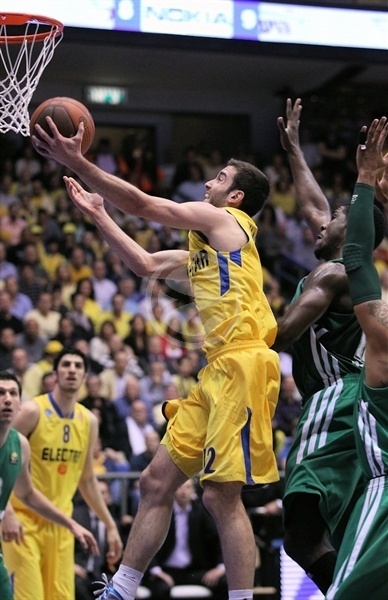 Another Saras basket helped the Greens fend Maccabi off. Fresh off the bench, Demond Mallet made it a 1-point game with a three-pointer – his first points since Game 1 – and Eliyahu followed with his trademark push shot to give the hosts their first lead since early in the second quarter, 65-64. Kaimakoglou put the Greens back up from the line; Blu returned the favor at the other end. The tension led to a flurry of fouls. 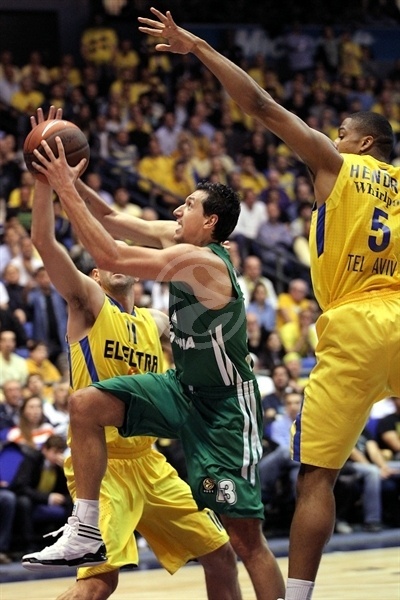 Diamantidis made it 67-68 with 2 more free throws with three minutes remaining. Kaimakoglou added another 2 from the line and then, after Hendrix rejected Batiste, Kaimakoglou appeared to grab the rebound and put his team up 5 with 90 seconds remaining. Maccabi used a timeout to lay out some plans. But after Hendrix drew a foul on the offensive glass, he missed twice from the line and instead fouled Diamantidis, who extended the lead to 7 with foul shots. A missed three by Blu further buried Maccabi. 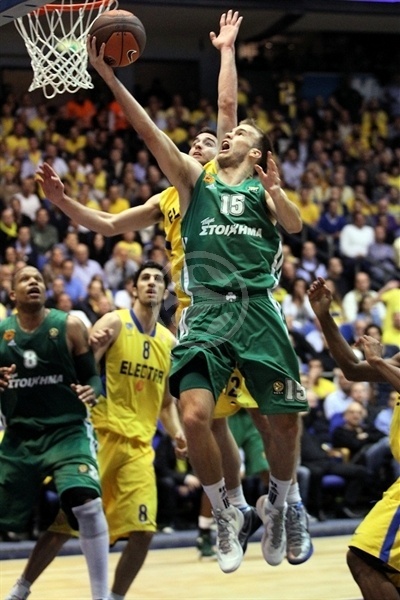 And as the fans started to head for the exits, Diamantidis made it 67-75 with 40.2 seconds to go. Then Guy Pnini missed badly from downtown and Diamantidis practically iced the game with another free throw. "They forced us to shoot from the outside. Today we couldn't create points without outside shots. We did our best, but it didn't work. 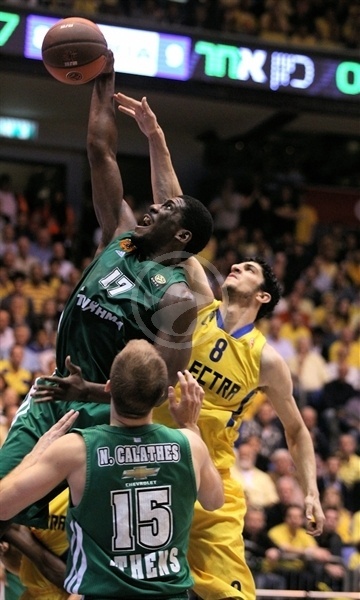 Panathinaikos played good defense, but we weren't at our best and that’s what decided the game. We have games with lots of assists, but today we had only 5 and that's never a good sign for us. I told my players I'm proud of them more than any coach can be proud of his players. We will check what went wrong, keep our heads us and go to Athens with a desire to win. That's what I told the players and that's what we will try to do. It's going to be one of the toughest games in the history of this club. It's the exact same atmosphere like here, only almost twice as many fans can get into the gym. We need to help Sofo see how he can stay out of foul trouble." "It was another really tough game. Also in the second and third games, I believed the whole time that we could come back, but this time it was a really difficult game for us and Maccabi. Everything that has happened in this series has given a lot of people in Europe great entertainment and they are happy for another game. There are people that have forgotten that Panathinaikos is European champion. Some people already eulogized us. We played a different game than two nights ago. I enjoy every time that I come here to play in this arena, because the people here know basketball. I hope to be here again soon. " 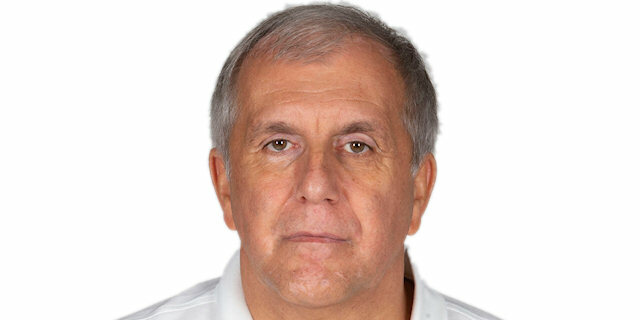 "I think that first of all we need to congratulate Panathinaikos for the way they played today. They, unlike us, were aggressive from the beginning. Now there is a fifth game. We have proven that we can win and we need to go there prepared. 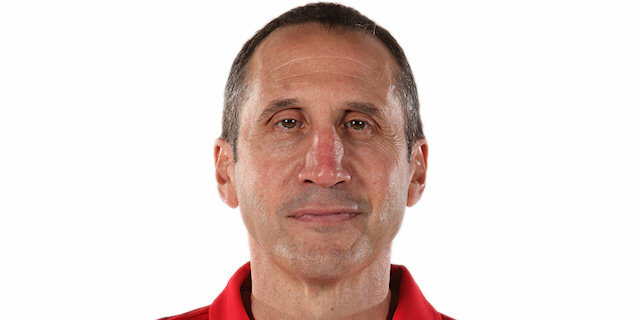 I didn’t play much during the fourth quarter because the coach decided so. Whenever coach calls on me, I’ll be ready. Our coaching staff will prepare us the best way possible and we will go to Athens ready." "It was a very tough game. Like any game against Maccabi. We played hard, executed the way we wanted and that's how we got this win. We had our backs against the wall, and we reacted. That's what we came to do here. Win a game and bring it back to Athens to our fans. Now we need to finish it. We have no time to celebrate."